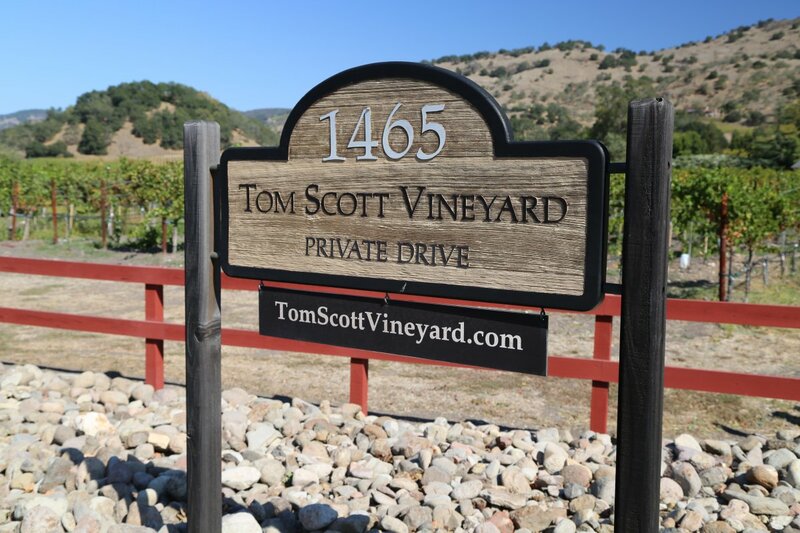 Tom Scott Vineyard – The beauty of working with vineyards or being a winemaker is that these are professions that can be reached by taking a number of different paths. You can be university educated, come from a family of winemakers or even enter the business without prior experience. Regardless of your entry into the industry, for those who want the hands on component, the key ingredients are passion, a willingness to learn and a recognition that there are as many paths that you can take in this industry as there are Napa winemakers. Take Tom Scott and his wife Lauren – Tom is as local as you can get having grown up in nearby Oakville on a prune orchard. He remembers working prune harvests back when Napa Valley actually had prune orchards. He spent a long career in the valley in construction and then in later years was a “master riddler” (a job that has since been automated at most wineries who make sparkling wine) and was also the production manager for what was S. Anderson Winery (now Cliff Lede). Lauren comes from Southern California and has always been interested in gardening. Before her involvement with Tom Scott Vineyard she had no prior vineyard experience or specific knowledge within the wine industry. Each earned their viticulture degrees later in life and have both jumped into the the management of their own small vineyard with a dedication to detail and micro-management that is quite rare in the valley (where the majority of vineyard owners hire out vineyard management companies). We recently had a chance to walk their vineyards – the Scott’s realize that the majority of winemaking starts and ends in the vineyard; their vines are meticulously maintained and it clearly shows. Both Tom and Lauren are equally responsible for the entire management of their vineyard. By this we mean they do everything – they planted the entire vineyard, put in all the vineyard stakes themselves (including welding over 2000 metal pieces for their trellising system), and are responsible for cover crop decisions, pruning each of their 2000+ vines, picking decisions and canopy management. Their vines are all head trained and cane pruned while keeping an eye on the previous years growth patterns which are used to help make decisions concerning future crop loads and cane management. They try to maintain a balance between crop load and canopy production which always varies somewhat as each vine is micro-managed on a case by case basis. Balance in the vineyard equates to balance in the wines. They practice “no till farming” – with a permanent cover cover and always use a lightweight tractor to avoid compaction of the actual soils (alluvial in nature, with parts of the vineyard being extremely rocky). They are the *only* commercial producer that we know of in Napa whose entire production is currently focused on a true single vineyard field blend where fruit from the various varieties in the vineyard are combined together to produce the wine. This is a Bordeaux styled wine. As Tom says, “let the vineyard show you what it will do”. The wines are a certainly a true expression of their vineyard. 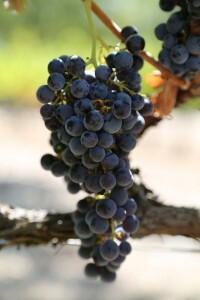 Their site is planted primarily to Cabernet Sauvignon with also Cabernet Franc, Merlot and Petit Verdot. Every year the percentages of each varietal in the final wine differ slightly based on the crop that nature gives. There is no sorting before fermentation – the Scott’s want a true expression of their vineyard’s range of flavor and do not want to limit this by pre-sorting fruit. With field blends there are no blending trials. In addition there are no acid adjustments made during the winemaking and indigenous yeast is used to kick off the fermentation. This is winemaking at its finest…and simplest. Their winemaker since day one has been Bill Ballentine; Bill is a third generation Napa winemaker who learned the art of winemaking from his grandparents. Today Bill specializes in winemaking for premium very limited producers including one of our favorite wines in the valley, William Cole. Their first vintage was released in 2003 with the 2004 and more so the 2005 vintage reflecting their own vineyard management practices. When you try their wine, the differences you will notice are based on the vintage. The style of their wines strikes a nice middle ground between wines with huge structure that need laying down for a number of years before being palatable and those wines that are ready to drink young. Their wines have great natural acidity, as well as structure and they will only continue to evolve new complexities in the bottle. Their wines appeal to a variety of tastes; both men and women. A typical year will see a production of merely several hundred cases. We tried a vertical from 2003 through 2005. While still young wines, additional bottle age treats their wines well; they only become smoother and more complex. There are no hard edges in Tom Scott’s wines. The 2005 is very balanced from start to finish – the nose is elegant and ripe but not overly so. Fruit driven aromas are present followed by a palate showing black cherry and baking spices with a hint of mocha rounding out the super long finish. 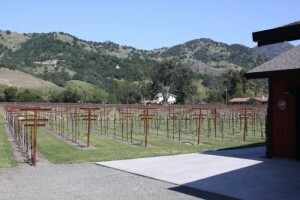 The 2003 and 2004 have completely different bouquets from the 2005 – both of these earlier vintages show some neat mineralities and dusty qualities on the nose representative of their specific Yountville terroir. The 2004 is a soft, supple, voluptuous rounded wine from start to finish. Cherry, blackberry, various spices and hints of tobacco show on the palate which has an almost creamy mouth feel. If you think the 2005 and 2004 vintages are smooth, try the 2003! And as each wine states on the back of the label, “no barn was harmed during the making of this wine”! Barn Burner is the name of each wine and is named after the brilliantly painted red barn that sits towards the back of their vineyard. 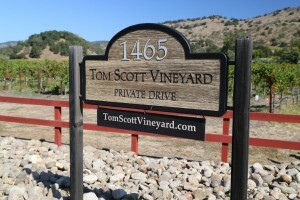 With the focus being on the vineyard and the wine itself, you will never see a big showy label on Tom Scott’s wines. The name of the wine and the vintage is all that appears on the front of the bottle. Their barn dates from 1936; more recently Tom gutted and renovated the entire building. Today it is definitely one of the nicest “barns” in the Napa Valley! Solar panels on the roof generate most of their vineyards electricity needs.